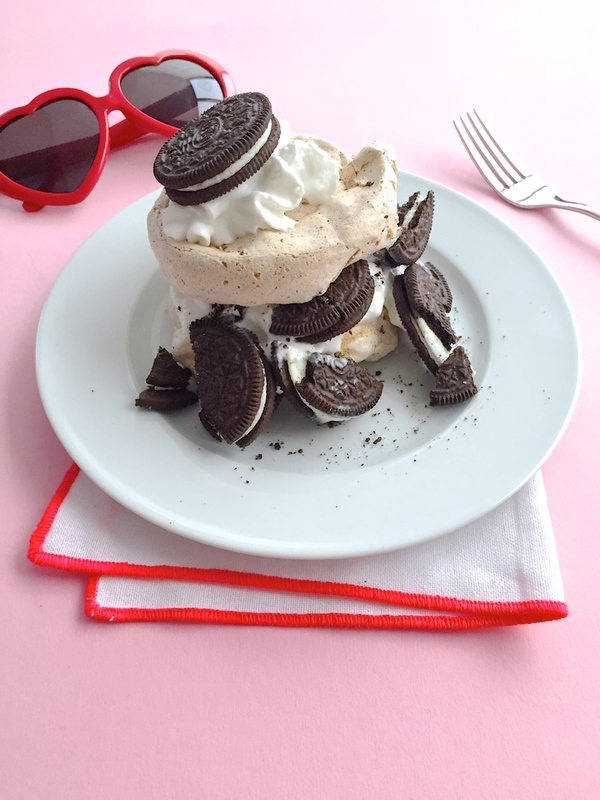 Miniature Cookies 'N' Cream Pavlovas: Next-Level Oreo Dessert! / Hey, EEP! 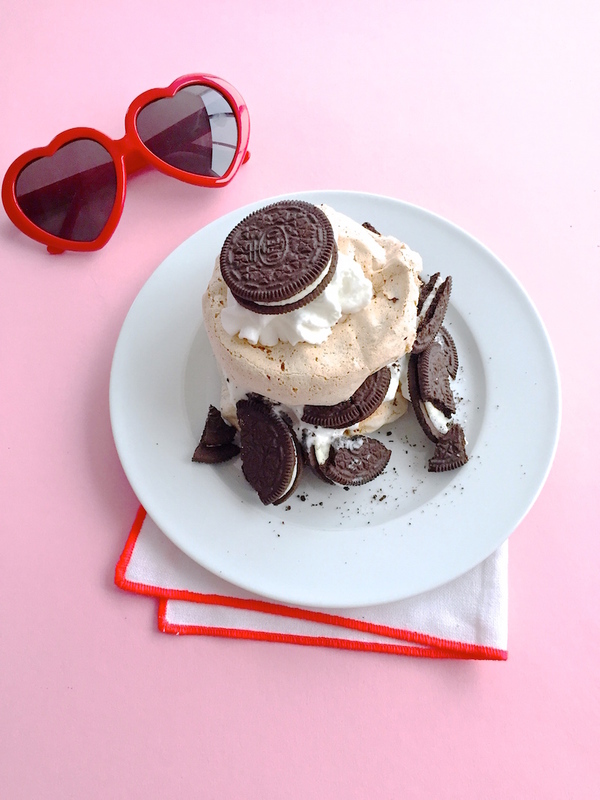 Miniature Cookies 'N' Cream Pavlovas: Next-Level Oreo Dessert! 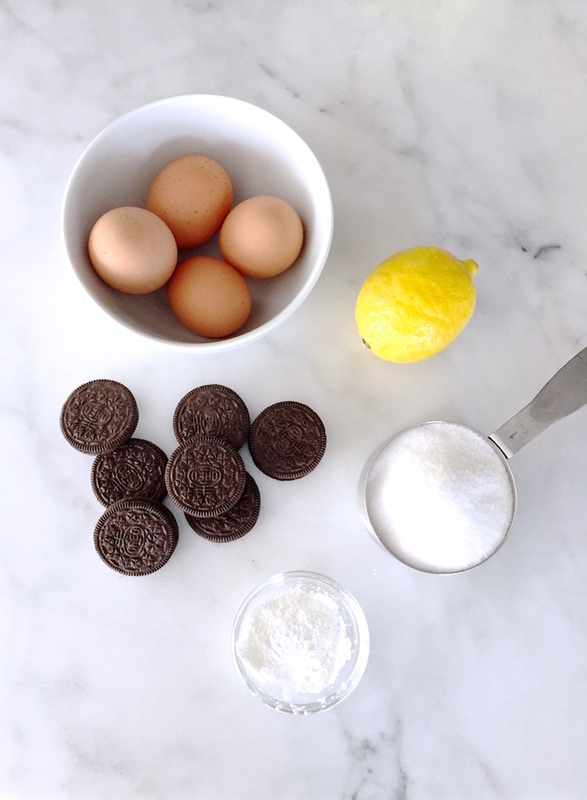 We all kind of went bananas over my Cookies 'N' Cream Cookies, remember? You shared it like a bazillion times on Pinterest and thank you for that! I LOVE knowing when you like a recipe. 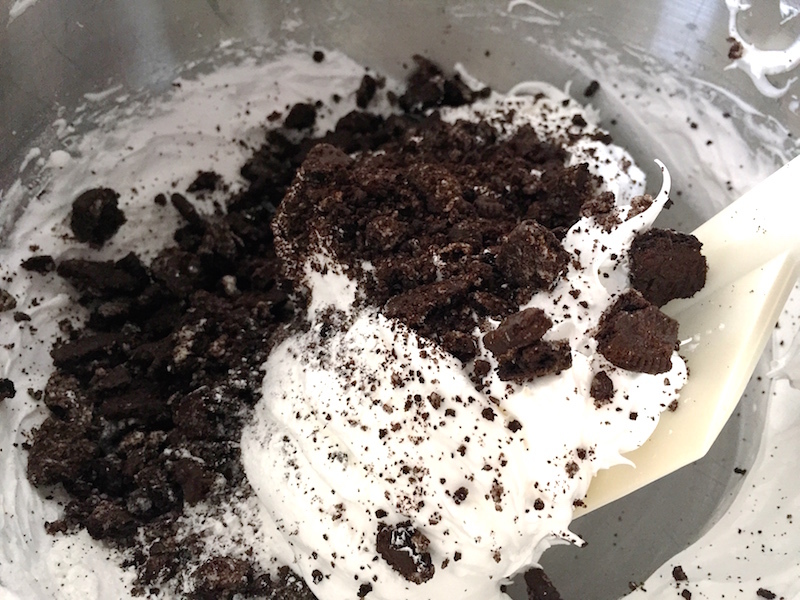 In fact, you inspired me to create another Oreo-laced treat: Mini Cookies 'N' Cream Pavolvas! Just when you thought Oreos couldn't get any better, right!? One of my favorite things about Oreos (besides the centers) is their crunch, so I wanted to make a decadent cookies 'n' cream dessert that really highlighted that rockstar texture. In the cookie department, we all know the only cookie crunchier than an Oreo is a homemade meringue cookie. Booorrrrinnng, I know! Nine times out of ten meringues are for calorie-counters, gluten-free eaters or Passover flour-abstainers. Am I right? I've never actually seen a human sit down and go to down on a meringue for, like, regular snacking purposes. You know what isn't boring though? Whipped cream. Oreos. Awesomeness. Another benefit to this recipe is that it's make-ahead. You can whip up the meringues a few days in advance, then assemble your sandwiches whenever you need 'em. Pull this baby out at a dinner party...forget about it! People will go crazy for the low-brow, high-brow combo of a fancy-sounding dessert bulging with grocery-store-aisle goodness. As always, here's a quick video to get you super psyched about the recipe. Are you guys liking these? Should I keep making them? Let me know in the comments below! One thing before you leave to make this fabulous recipe. If you're not into the cookies 'n' cream thing, you can still make this recipe with another cookie. Oreo makes unique flavors now, so you could try your hand at a Birthday Cake Pavlova or maybe a Watermelon Oreo Pavlova. Wouldn't be my first choice but—hey!—you do you. 1. Preheat the oven to 300˚F. Line a baking sheet with parchment paper; use a water glass to trace circles onto the parchment paper and turn over—this will be your pavlova template! 2. Beat the egg whites with a mixer fitted with the whisk attachment on medium-high speed until foamy. Add a pinch of salt and keep beating. With the mixer running, slowly beat in the sugar, about 1 tablespoon at a time. Increase the mixer speed to high and continue to beat until stiff peaks form, 4 to 5 minutes. 3. 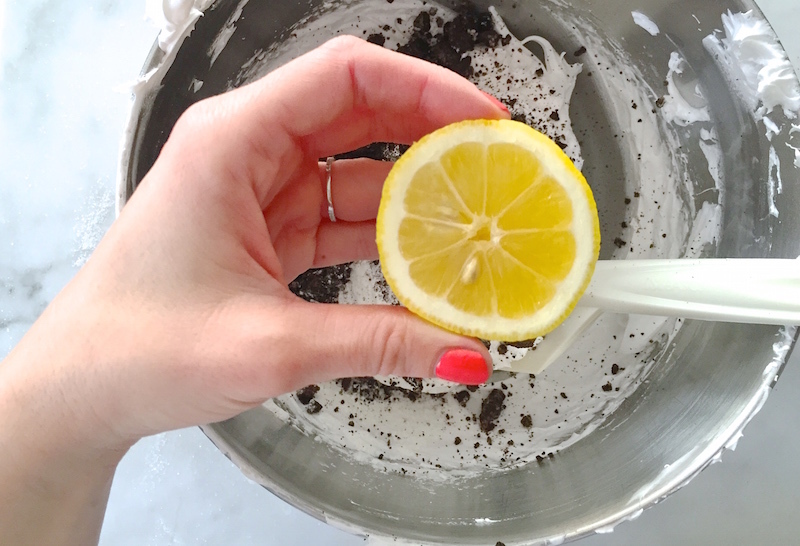 Sprinkle the corn starch, lemon juice and about 7 crushed Oreo cookies over the egg whites (you can add a splash of vanilla, too, if desired...I ran out)! Gently fold the ingredients into the stiff egg whites. 4. Spoon and spread the egg white mixture following the template on your baking sheet. Bake 30 to 35 minutes or until crisp. Let cool on the baking sheet 10 minutes, then transfer to a wire rack to cool completely. 5. To serve, crush up the remaining Oreos. 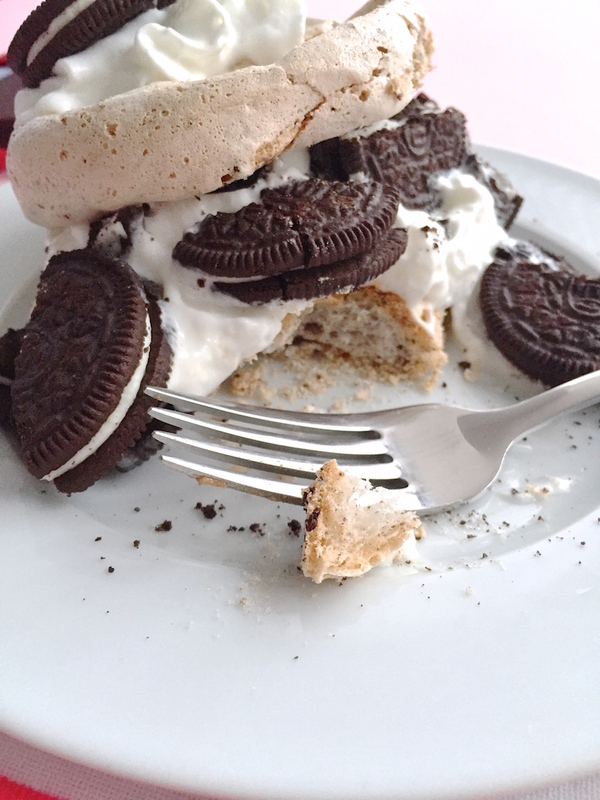 Top half of the meringues with whipped cream and crushed Oreos; top with another meringue to make a sandwich. Garnish with more whipped cream and Oreos as desired. Um, excuse me. This is out of control delicious sounding! Pavlova is one of my favorite desserts ever but I have only ever tried it the very traditional way with cream and strawberries. Yum, yum.